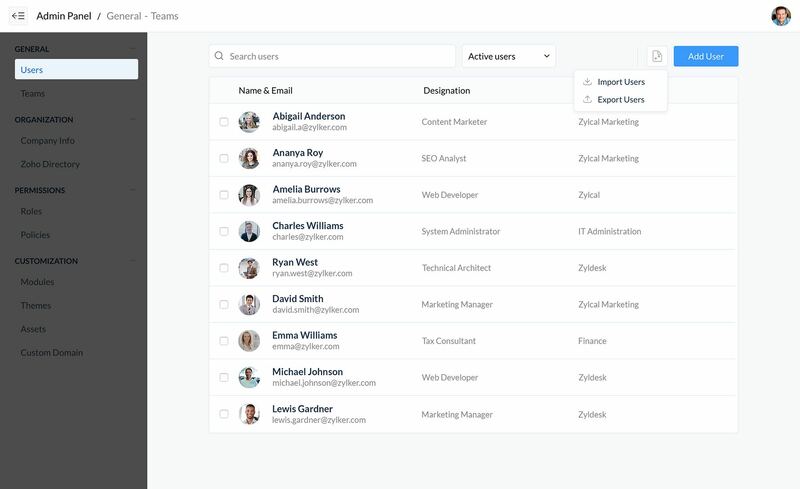 Get a comprehensive view of Cliq's features to understand how they can help your team collaborate better, faster and communicate easier than ever! 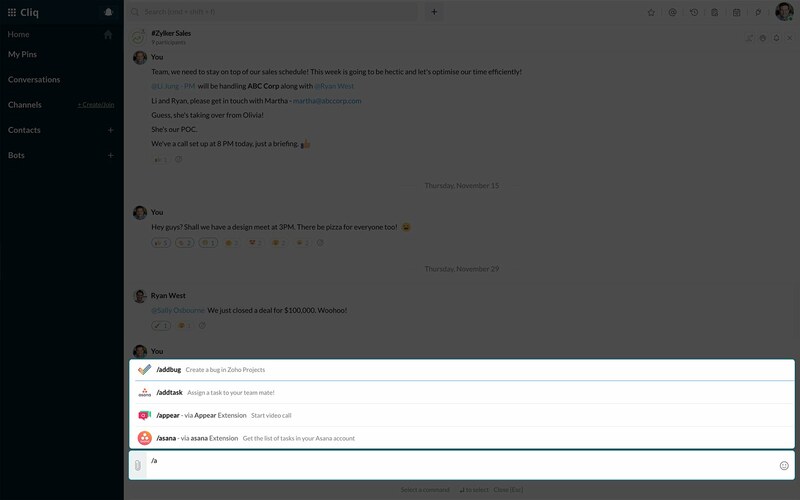 View offline chat notifications, upcoming event reminders, as well as new bots and commands from your home screen. To send a direct message, just click on the contact name and start typing in the text area. 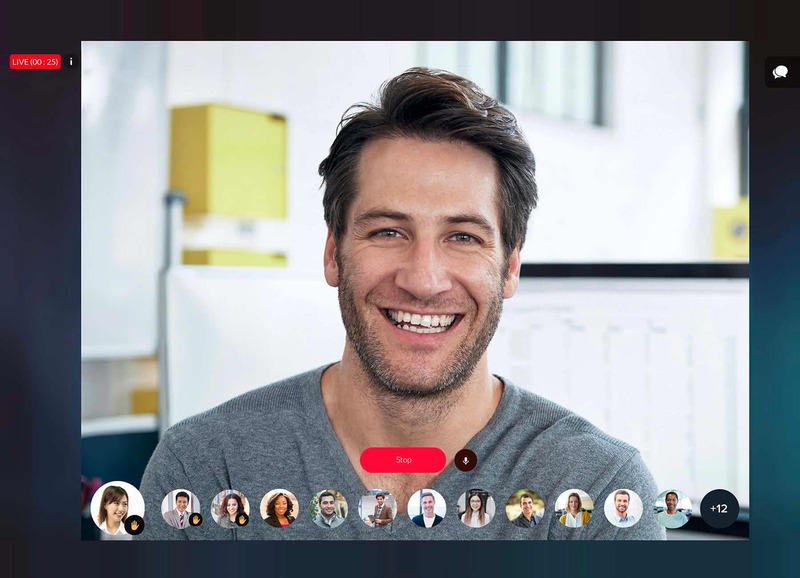 Hop on a call or a video chat, to connect with your teammate anywhere and from any device. 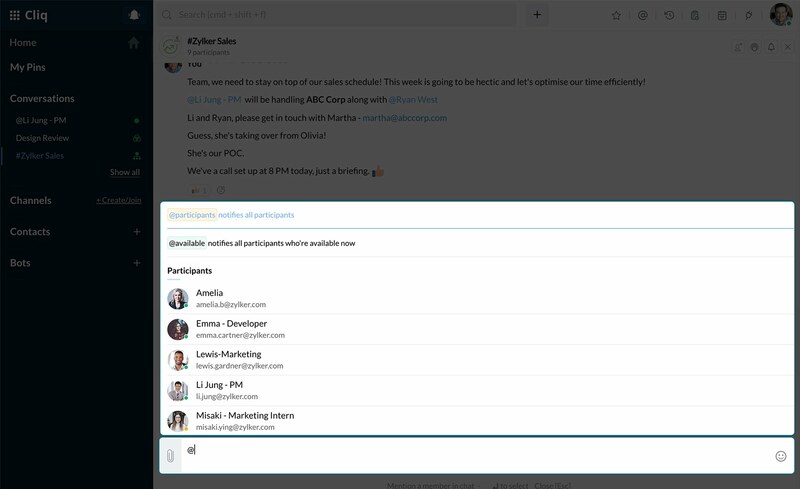 Share your screen and ideas, even when you're on an audio or video call! 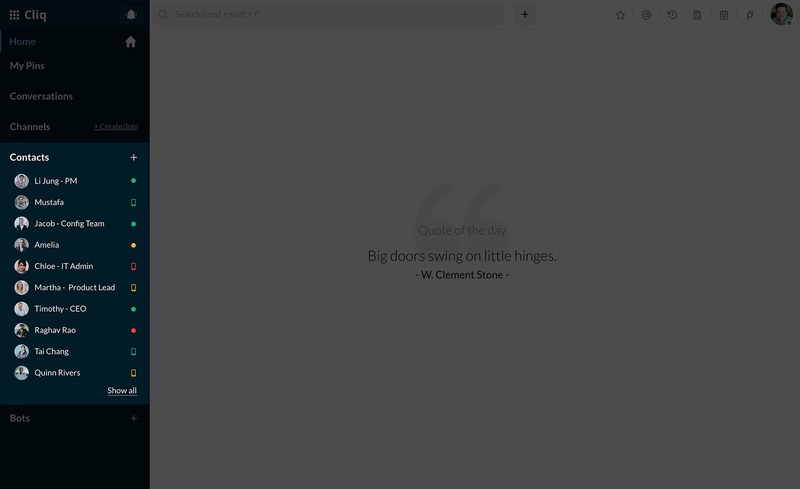 To share your screen, click on the Share Screen option in the chat header. @mentions a user in chat to notify them. 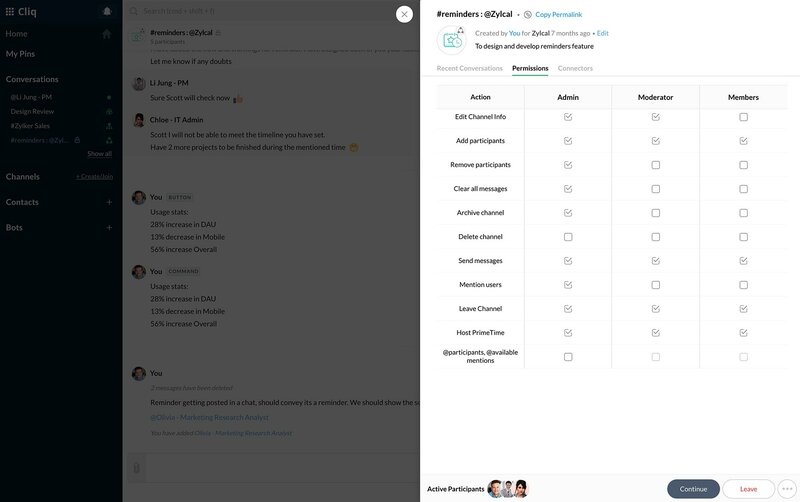 You can also use @participants to address everyone in the group or @available to get the attention of all group participants who are currently available in Cliq. 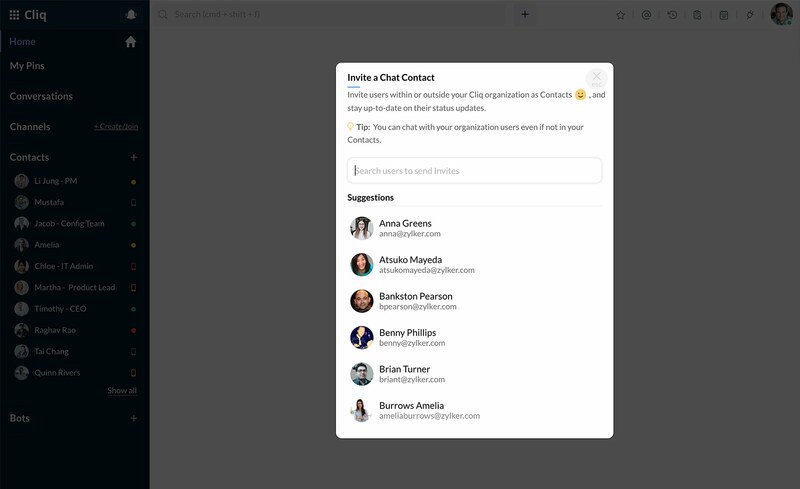 Create a group chat with context by forking conversations. 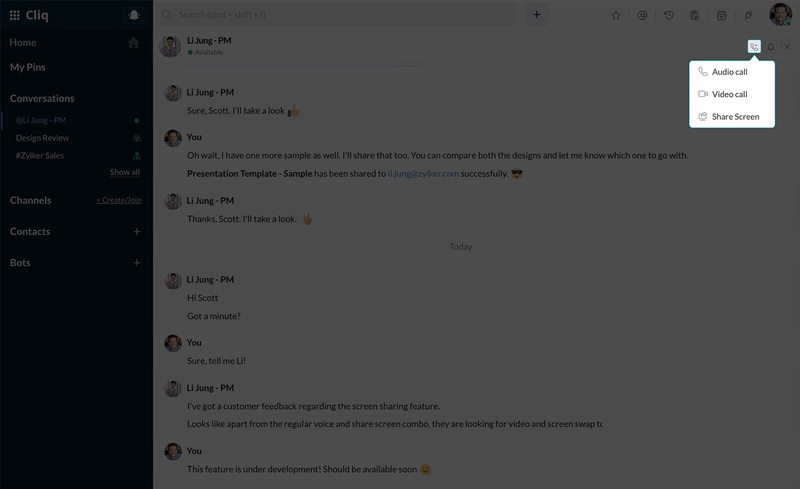 You can do this by hovering on any message in a conversation and clicking the Fork From Here option under Message Actions. 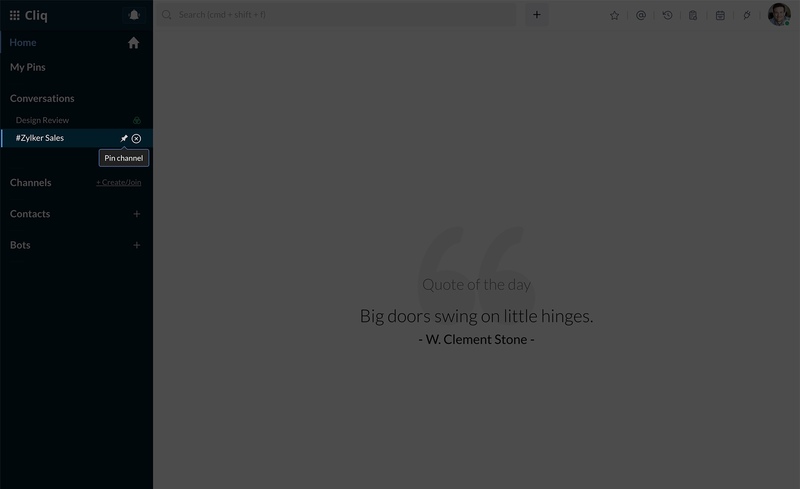 Bookmark important messages in a conversation by starring them category wise. Click on the star icon to view the list of all the starred messages! Pin important chats for easy access. 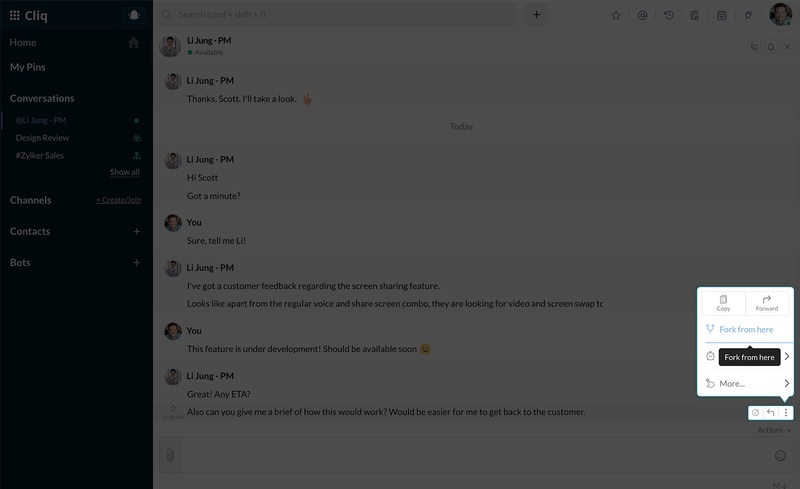 Hover over the chat name and click on the Pin Chat icon. Use the quick create menu to perform an action. 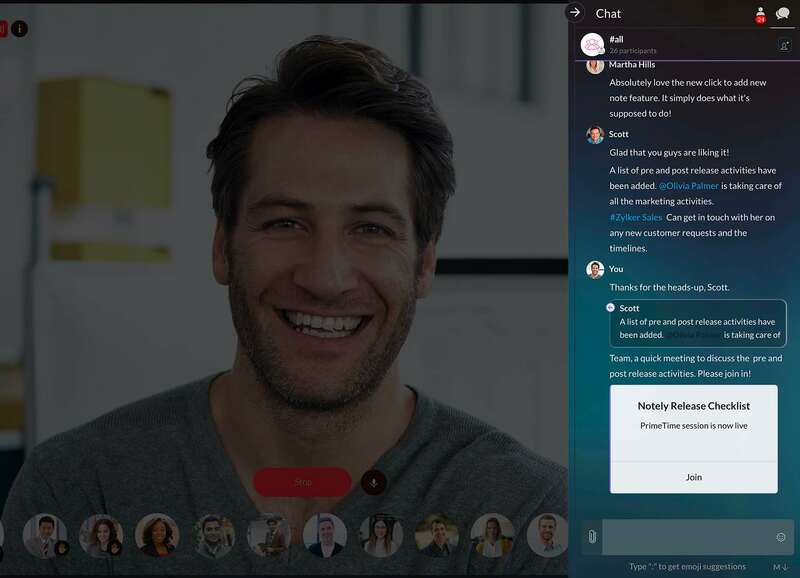 From creating a group chat, setting a reminder or hosting an instant PrimeTime video session, you can do it all! Locate old messages in an instant with Cliq's advanced text and file search options. 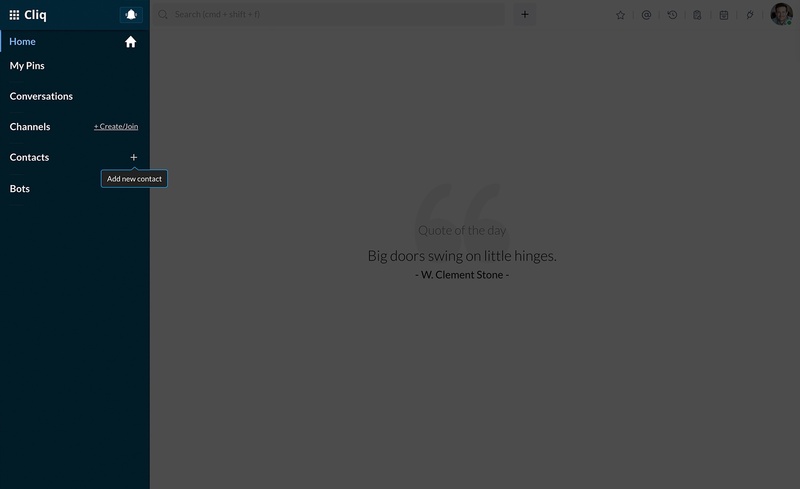 Enter a phrase in the search bar and you'll pull up all messages where the phrase has been used. Turn off chat history for conversations you don't want saved by clicking Actions above the text bar and choosing the Turn off history option. To add a contact, click the + icon next to Contacts in the left pane. Type their email address in the Invite Contact dialog box, send them a personalized message, and click Invite. 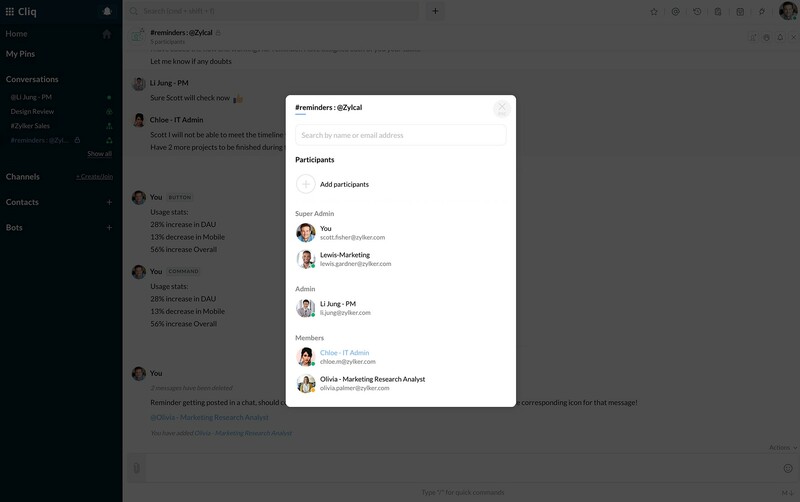 All mutual contacts will be listed under the Contacts section in your left pane. 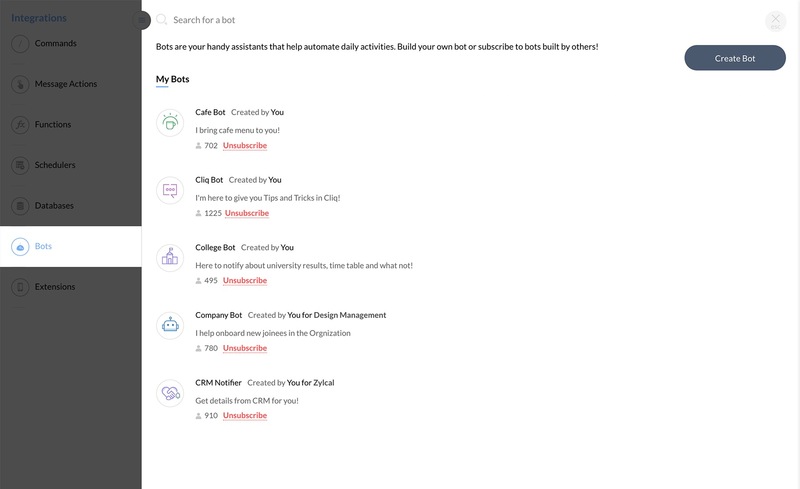 Create a channel by clicking on the Create/Join option next to Channels in the Left Panel. 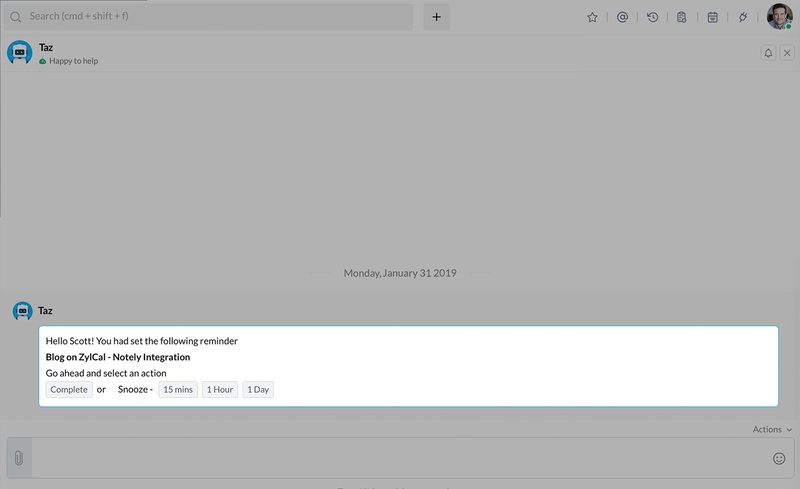 Search and join existing channels from the channels section. View channel participants and their roles by clicking on the number of participants under Channel name in your chat header. 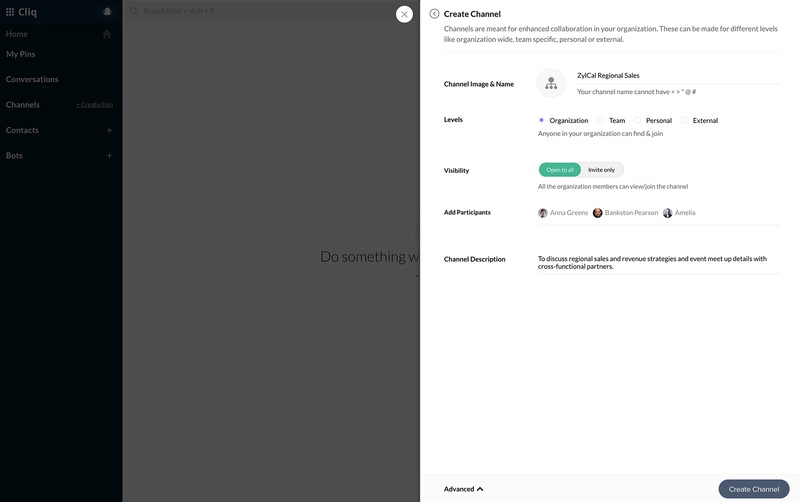 You can view and moderate permissions based on participant roles from the channel's preview section. 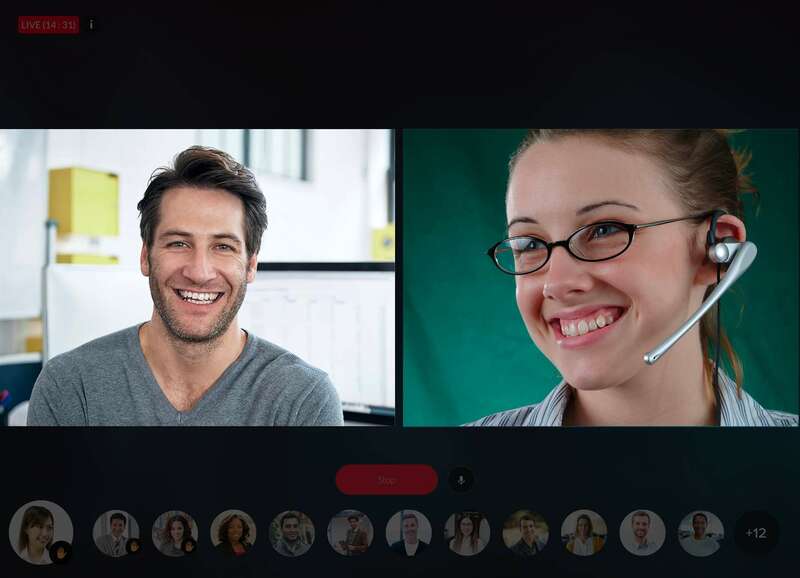 PrimeTime is Cliq's video broadcasting feature to help remote teams collaborate better. 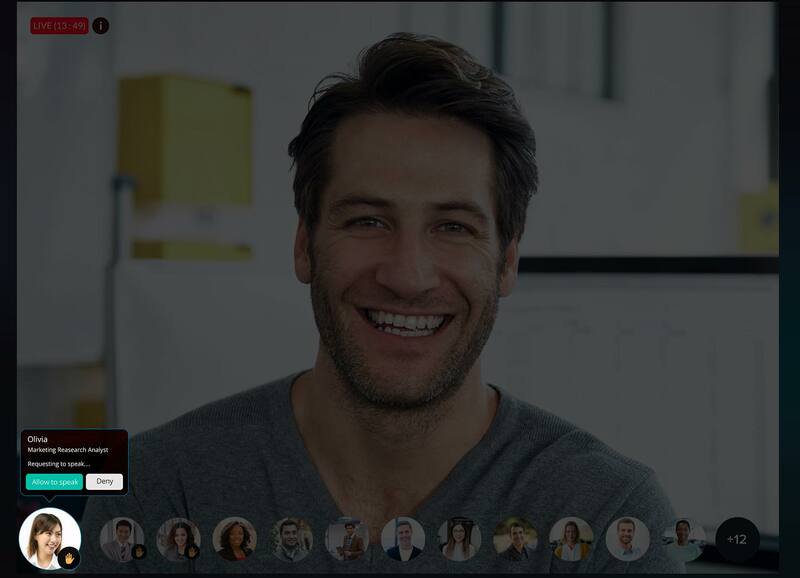 Begin a session by clicking the PrimeTime icon and enabling camera and microphone access. As the session host, you'll be addressing the audience. Attendees in the session will be listed at the bottom of the window. 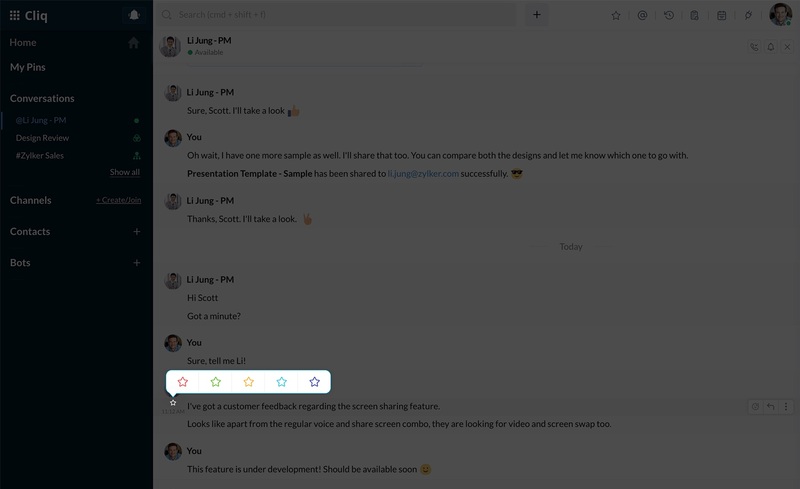 Once your PrimeTime session begins, you can click the Chat icon in the top-right corner to access your chat in the same window. All attendees can use the raise hand option if they would like to join in as a co host. The host can decide to approve or decline a request. When the host approves your request to speak, you will be joining in as the co host. You can add a reminder for yourself, teammates, a group conversation or a channel. 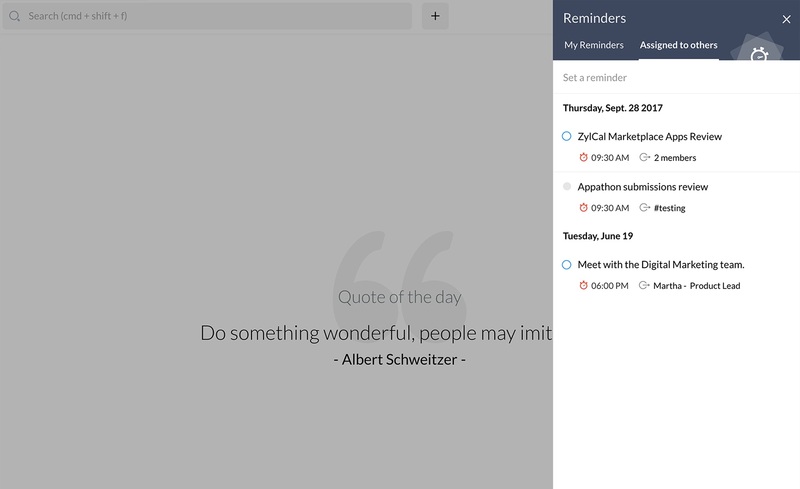 View reminders assigned to you, by yourself or your teammates under the My Reminders section. Reminders that you've assigned to teammates, group conversations, or channels will be listed here. 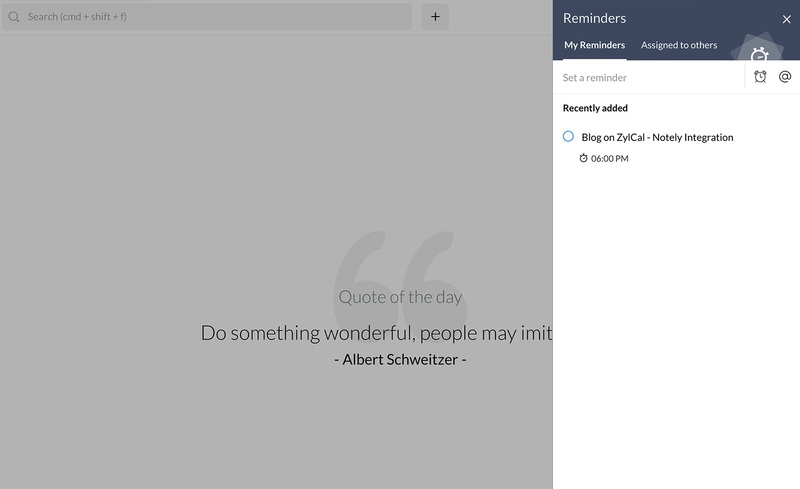 @Taz notifies you of due reminders. You can either mark it as complete or snooze the reminder. 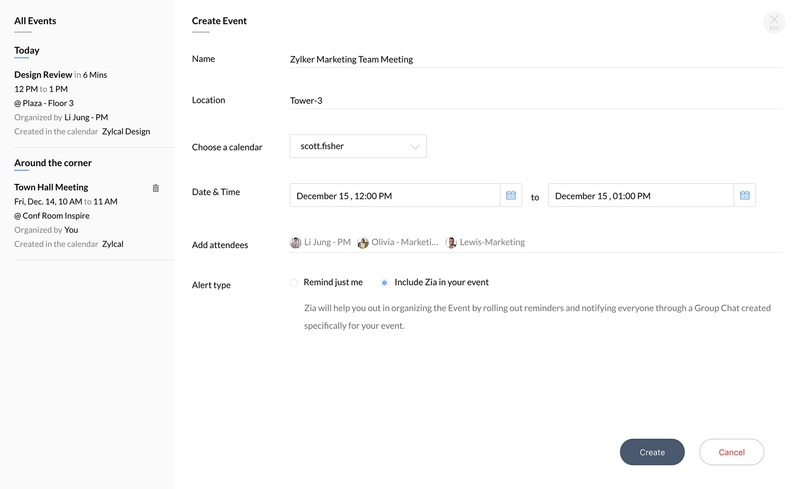 To create an event, click the event notifier icon in the top-right corner and select Create Event. 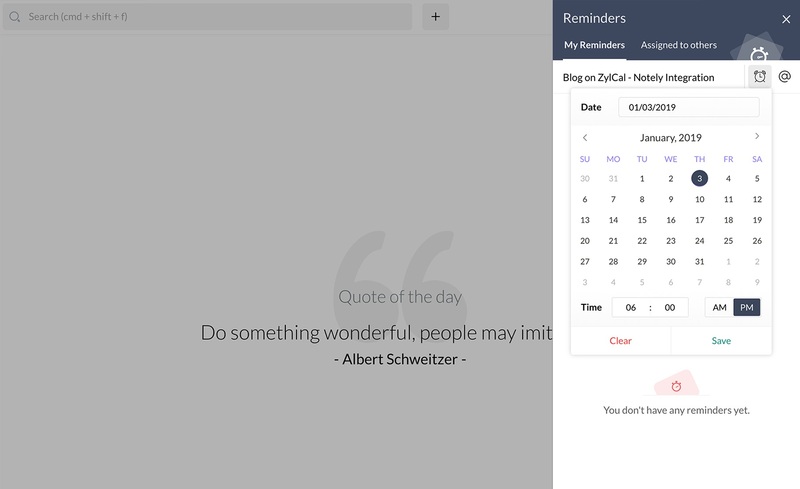 Zia is Zoho's intelligent assistant; use it to automate event reminders. 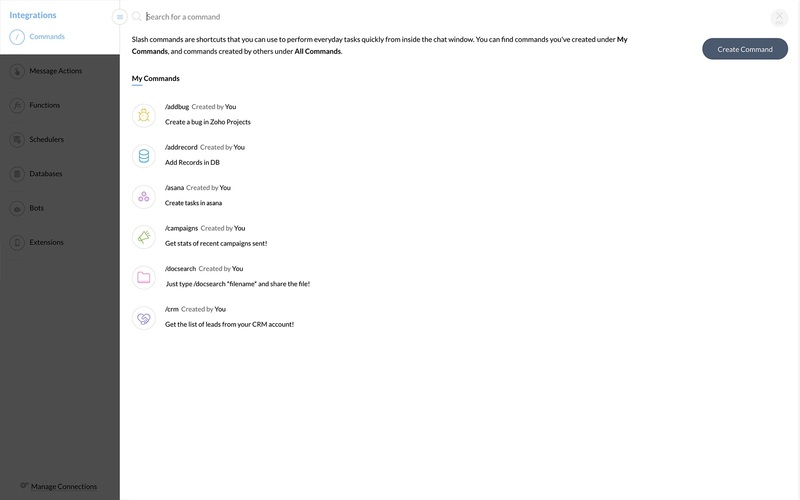 Just select the Include Zia in your Event option. 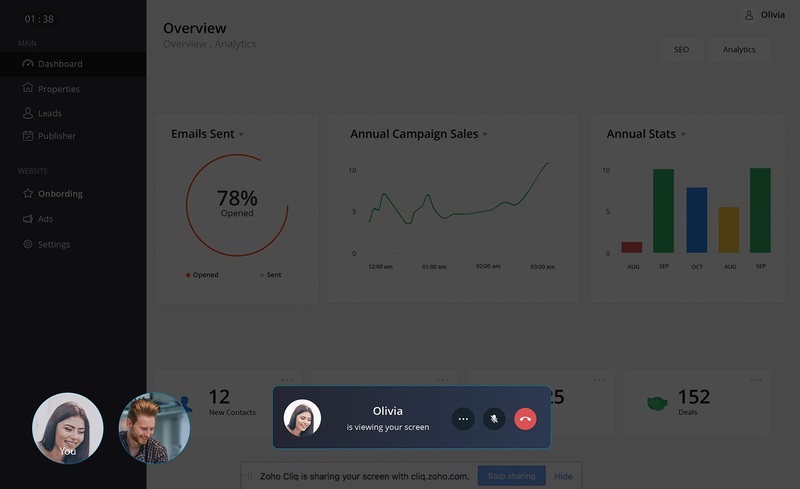 Cliq identifies the message context and provides you suggestions to follow-up! 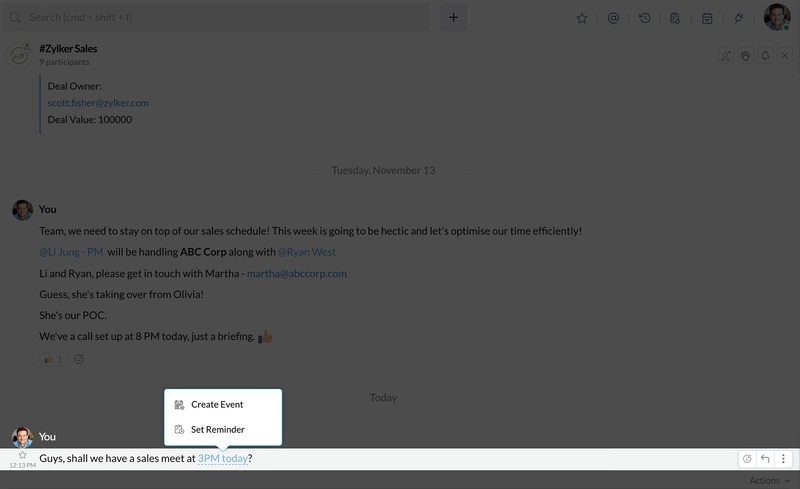 You can either create an event or add a reminder using smart suggestions. 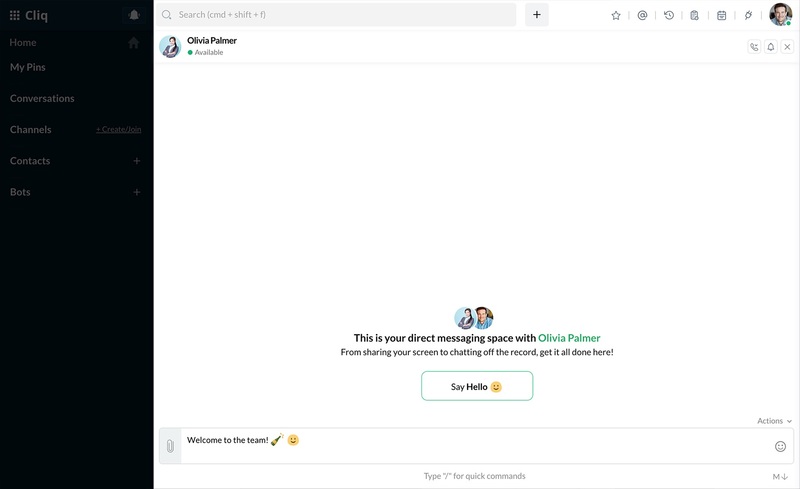 Bots in Cliq are conversational assistants that can be involved in a conversation, asked to perform a task, or bring alerts. 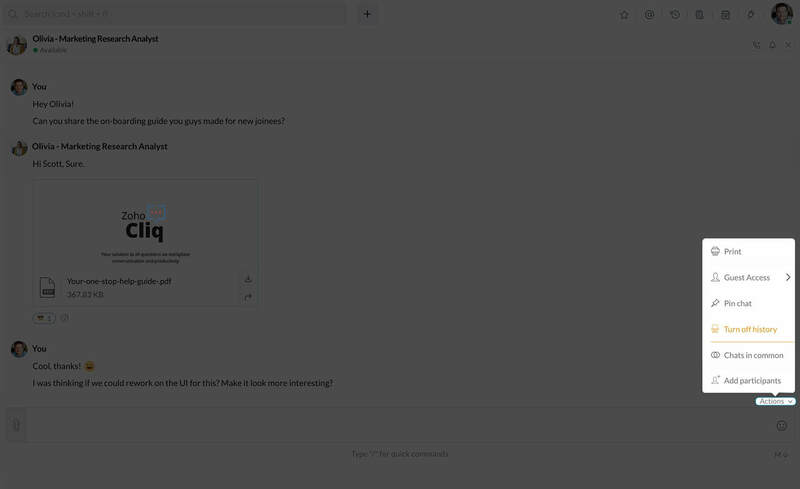 Subscribe to available bots by clicking on the + icon next to Bots in the left pane. 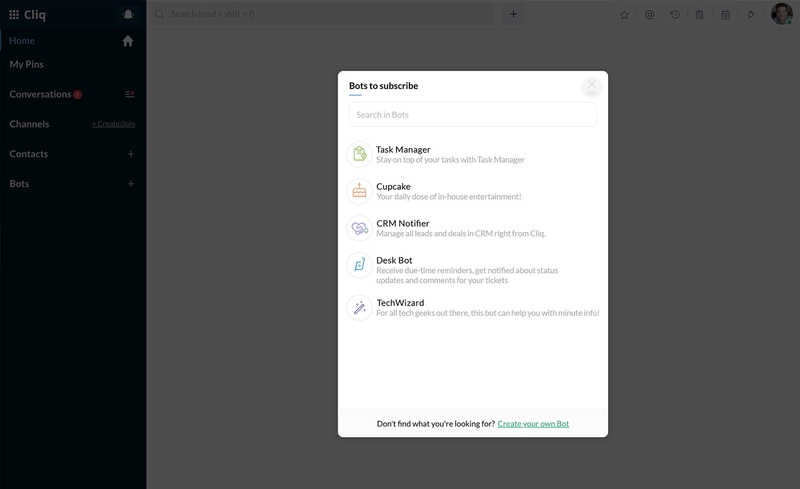 Open Settings, then select Integrations and choose Bots. 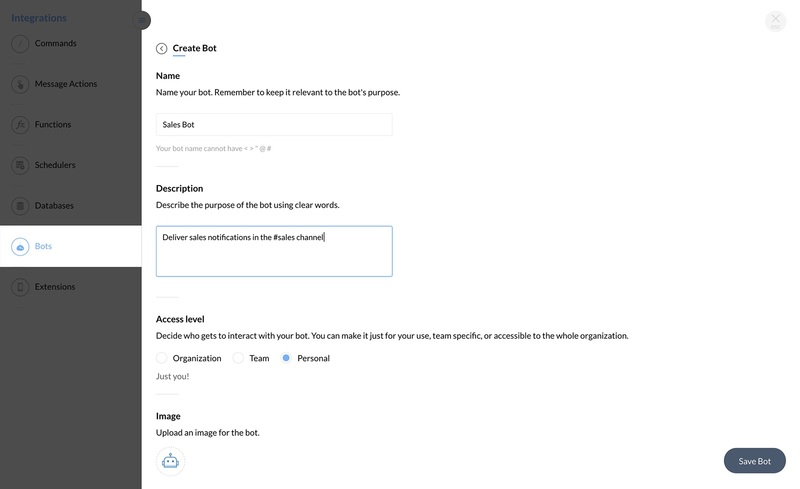 From here you can view all the bots in your organization or create new ones. To create a bot, get started by adding the bot's name, description, display picture and status. 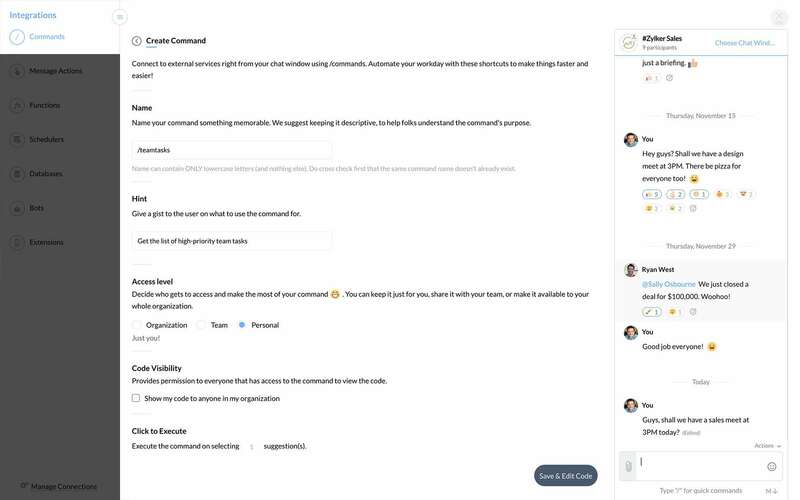 Slash commands are shortcuts you can use to perform quick actions. 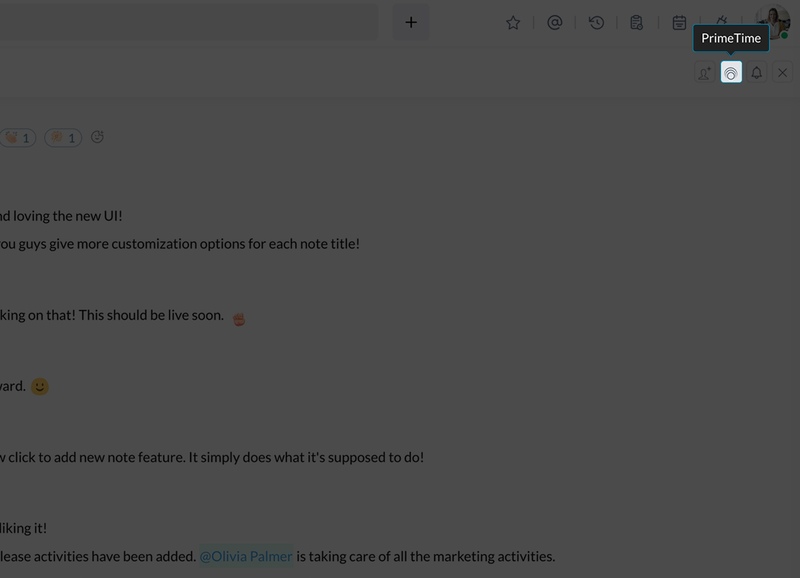 Simply typing / in the chat window will pull the list of commands available for you to use. 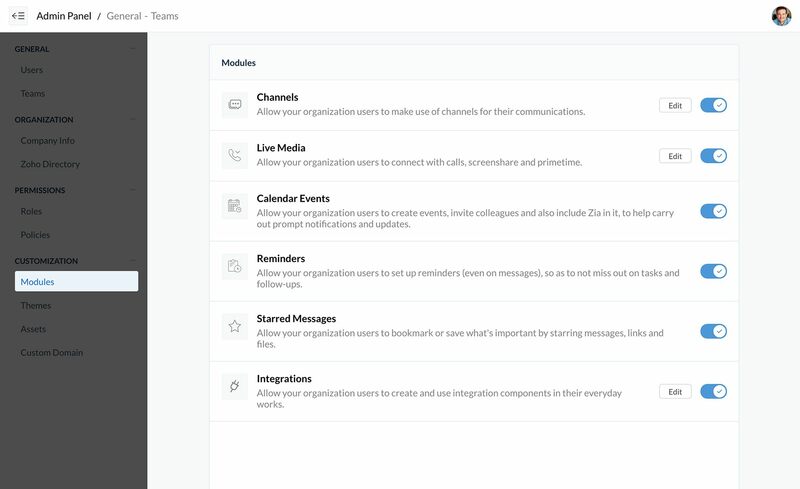 Open Settings, then select Integrations and choose Commands. From here you can view and create slash commands. Create and configure a command by giving the command a name, a description, a display image, and parameters. View all installed extensions by opening Settings, selecting Integrations and choosing Extensions. 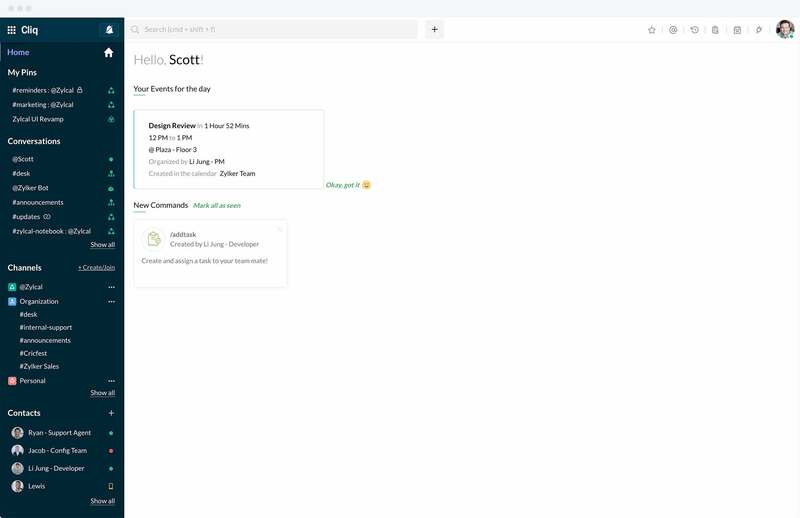 From here, you can create and activate custom extensions. 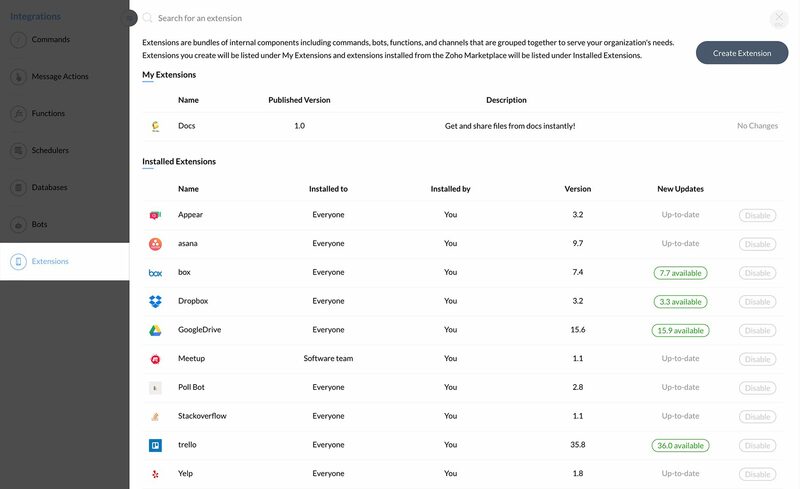 You can find and install all available extensions here. 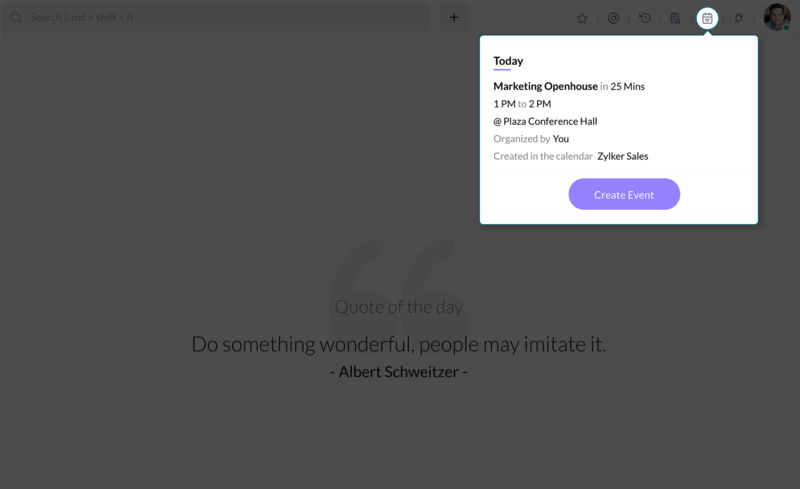 You can create your own extension and publish it in the marketplace. 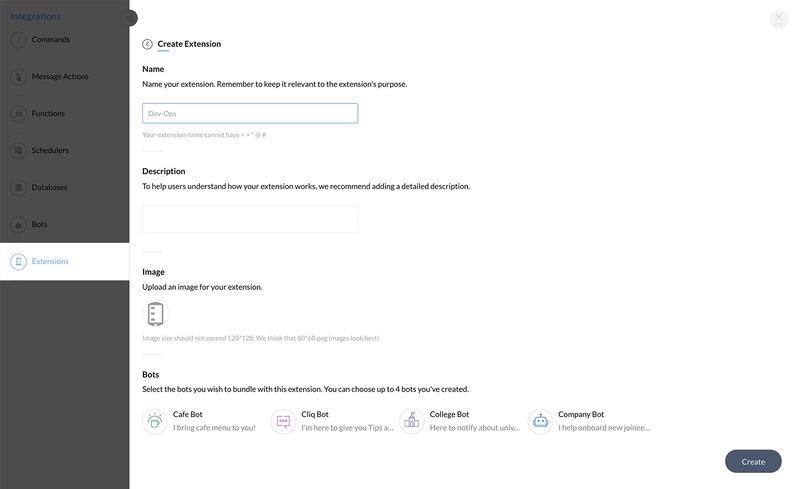 Select the integration components you would like to bundle into an extension and publish. 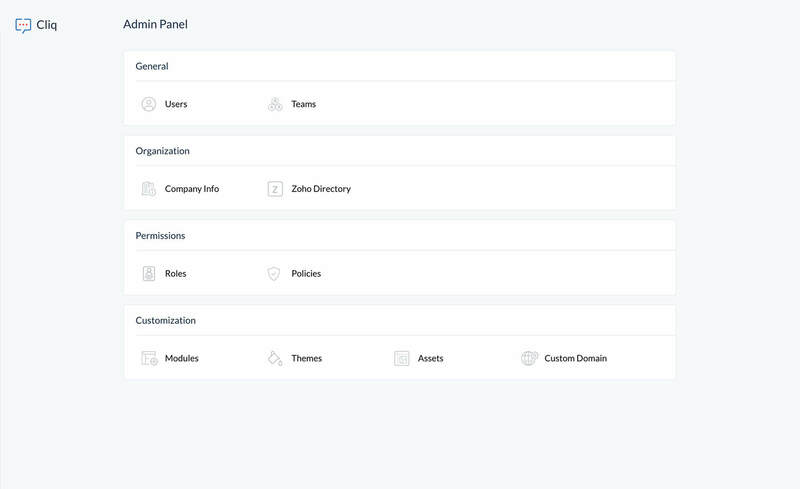 The dashboard provides an at-a-glance view of all the sections that you can use to set up and configure Cliq for your organization. 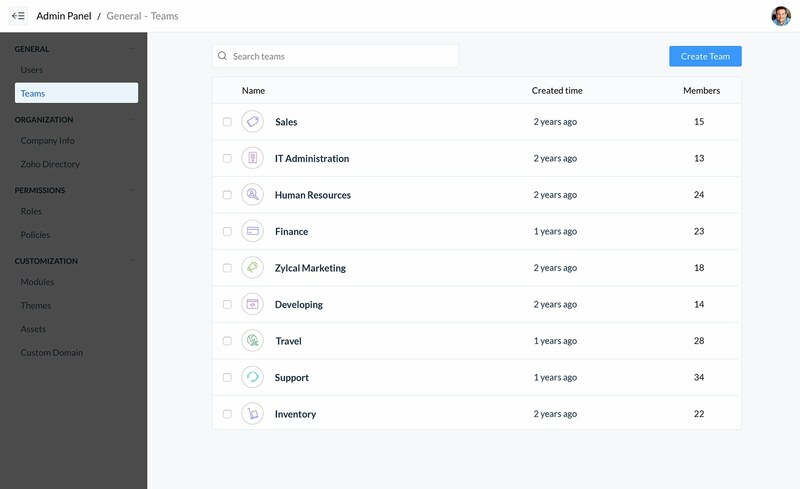 Manage all your user records —view, update and export existing user details, or import new records— from one central location. 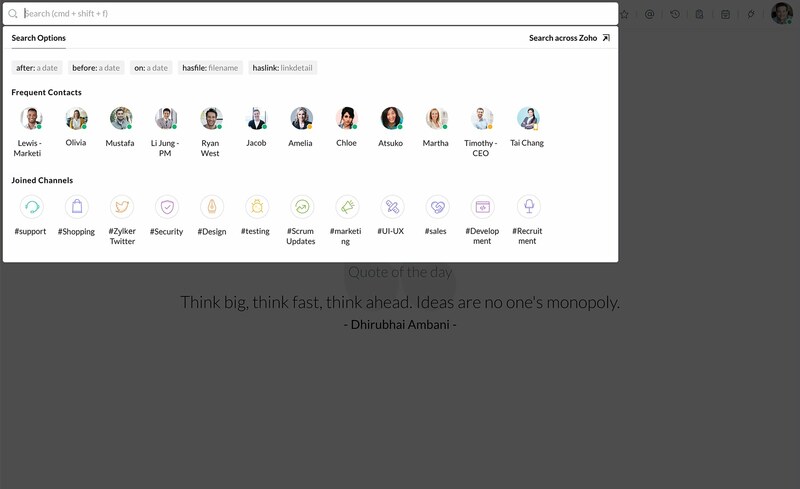 Create teams, categorize them into departments in Cliq to reflect your organizational layout. Choose from a list of modules we've laid out and tailor-make Cliq to suit your needs. 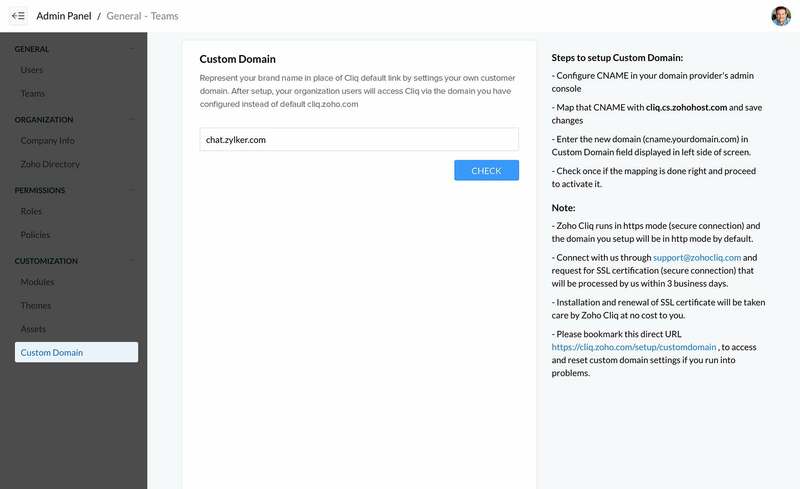 Make Cliq accessible within your company by setting up a custom domain. 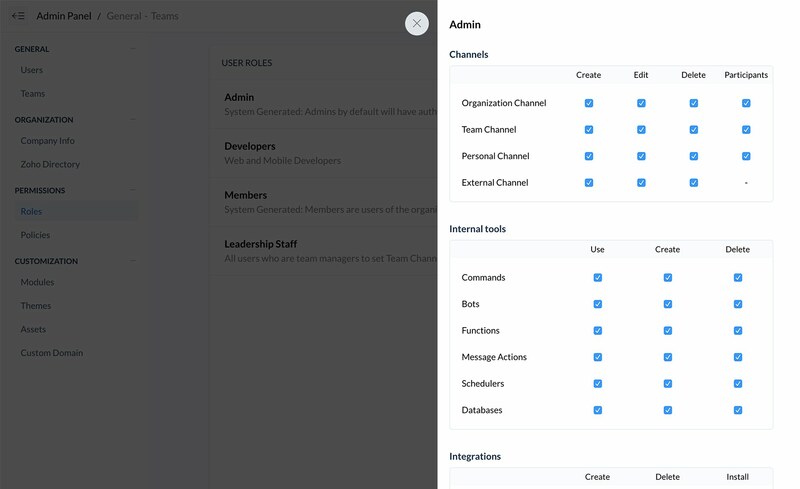 Configure roles for users based on your organizational hierarchy. 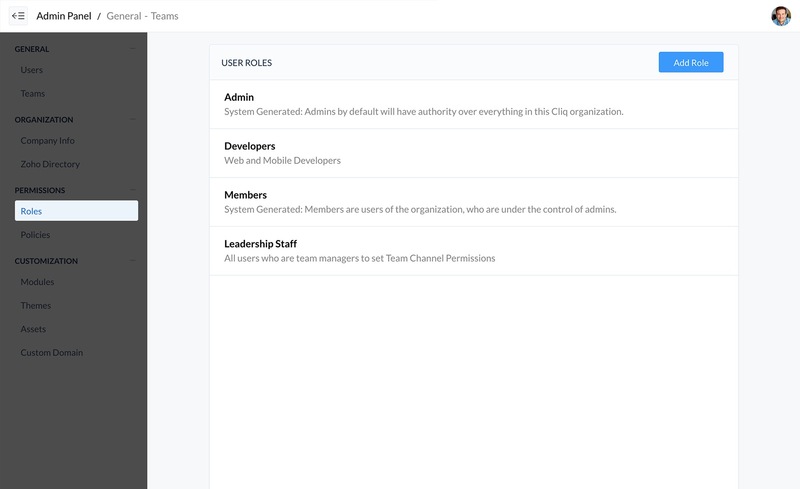 Set permissions for user roles. Selectively decide who gets to access and perform module actions. Go ahead. Take Cliq for a spin.